Everyday is a school day – I truly believe this… after all of my years of painting Kitchens and Furniture, I am always delighted to learn about a product or technique that we a) help to produce a better finish and/or b) make the process more enjoyable… this happened in spades with this project. 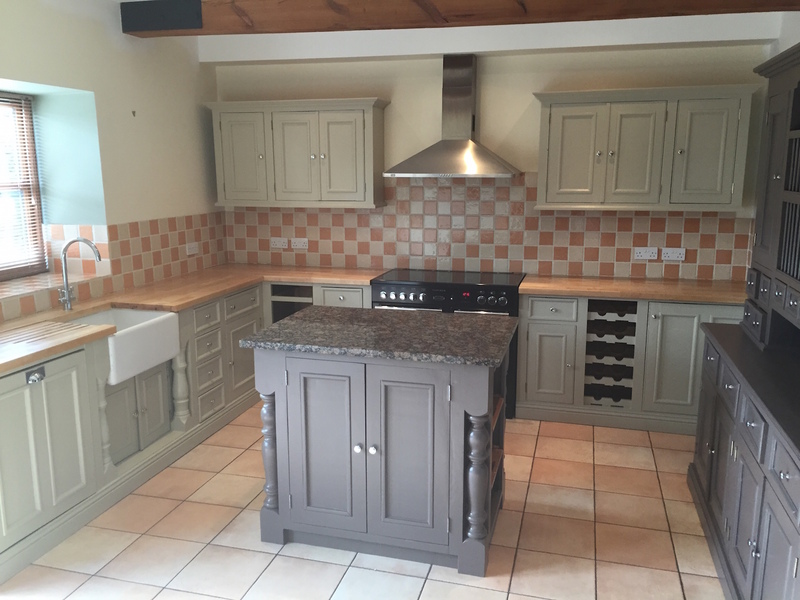 This Kitchen – housed in a lovely Mill House conversion in Staffordshire – is a classic example of the type of Traditional Painter work that I attract – a well used and loved Kitchen that needs a bit of TLC to update it. The substrate was a waxed pine – not usually a problem… I use *Krud Kutter Original and Methylated Spirits to dissolve and clean away the wax ready for painting. However, this kitchen was the waxiest Kitchen that I have ever encountered! My client reliably informed me that he himself had waxed it twice with a proprietary brand of tinted wax. Needless to say, my usual approach just wasn’t going to cut it in this instance. 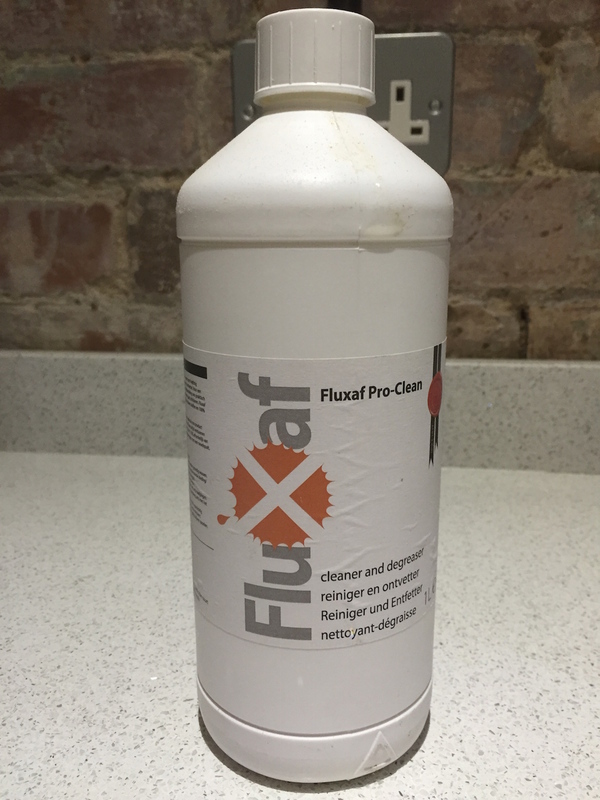 So following a few International calls to friends and contacts (I kid you not; Spain and Holland), I broke out the *Fluxaf Pro Clean; a super concentrated cleaner that will “dissolve the enamel from your teeth”, but, is still an environmentally responsible product. Willem at Fluxaf told me to apply the product diluted with warm water 1:1 and then neutralise with clean water… the result was fantastic – the wax “changed it’s state” and turned into a dry tea-like substance, falling away from the wooden surface… incredible! My preferred Tikkurila paint was applied to the now clean and prepared substrate using various *FOX brushes (available from MyPaintbrush) and a few brushes that I’m currently developing ready for later on this year – wink, wink. Additionally, my client asked me to restore their beech work top… which had been sealed with an “orange product”. 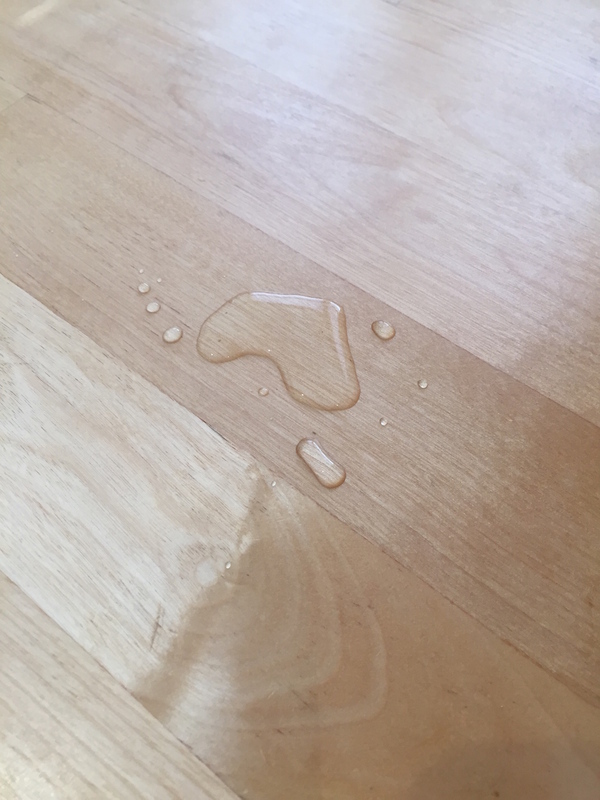 After sanding off the “product” with my *Mirka DEROS sander, attached to my Festool Extractor (99.5% dust-free), I applied a product called Patina – a gel product that protects and enhances bare wood… my go-to product for work tops. 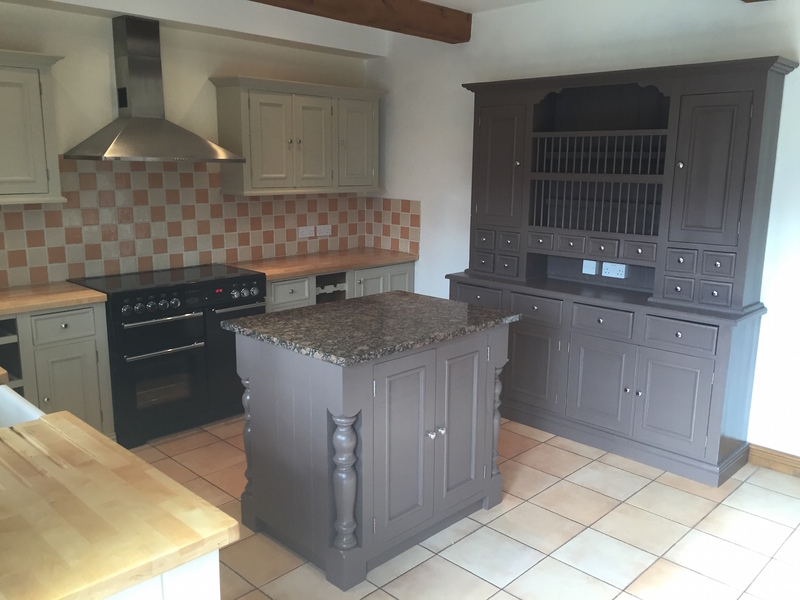 “After a great deal of research and deliberation we finally decided to have our waxed pine kitchen painted and we found Martin Guest on The Traditional Painter website. We felt that trying to paint the kitchen ourselves was too big a job. After emailing Martin photos and following a couple of phone calls and emails we agreed his quote. The dust free sanding that was advertised was exactly that; our own DIY sander fills the house with dust whereas Martins unit was fantastic. The large amount of old wax on our units did pose a few problems for him and took longer than expected to remove but once painting began it progressed uneventfully apart from me changing my mind on one of the colours when the undercoat was put on which resulted in an urgent overnight delivery of new paint! We chose paint colours to blend in with the existing wall and floor tiles and decided that painting all the units the same colour would not look as effective as different colours so we had a dark colour (London Clay) on our dresser and island unit and a lighter stone colour on the other units. So we are very pleased with the final result and with the attention to detail and quality of the workmanship that Martin gave during the work. For further information about my work and how I go about it, please visit my website; handpainted.kitchen Martin Guest, Traditional Painter for the West Midlands. This entry was posted in Uncategorized and tagged Fluxaf, Fluxaf Pro Clean, Hand Painted Kitchen, Staffordshire, Tikkurila, Tittensor, Traditional Painter, West Midlands on February 27, 2015 by mjguestltdblog. It worked very well Mark… and great support from Willem too! Thank you for your comment, very kind.